Just five of the 200 or so panels that make up the finished project. Back in 2008/09 my sister-in-law and former colleague Laura Boswell won herself an extraordinary commission to create an enormous 660 square meter mural as part of Aylesbury’s regeneration of their transport infrastructure. When she left Collections in 2000 for life in the country we all thought she'd be happy making jam and digging her garden. She did for about five years before deciding to go back to lino cut printmaking. We thought she'd be happy with that too, but she had bigger ambitions. You can read the full story on her web site lauraboswell.co.uk/gws and you can take a virtual walk along the whole mural here. 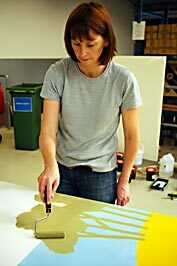 Since completing the mural she has also spent two months in Japan learning Japanese woodblock printing and is currently working on another slightly more modest public art project, another enamel sign of about 12 square meters for Leysdown-on-Sea, Kent. Details of all her projects and samples of her work are up on he web site lauraboswell.co.uk.